It's one of the biggest lotteries in Europe, but for a very low price per line. It's also got huge jackpots, ten different prize tiers and a total of three additional bonus games – all in all making 6 aus 49, aka the German Lotto, a world champion lottery. The name 6 aus 49 literally translates as six out of 49. So once you know the name of the game you already know how to play it – how's that for German efficiency? Once the main six numbers are drawn another bonus ball is drawn. This number corresponds to a pre-existing serial number. There are also up to three bonus games; with two raffle games drawn on Wednesdays and three drawn on Saturdays, for even more ways to win. How does playing the German Lotto at Lottoland work? Instead of entering the official 6 aus 49 Lotto draw, you place a bet on the outcome of it. You pick the numbers you think will be drawn in the same way as if you had entered the official lottery draw. At Lottoland, you win the same prize money for each prize tier that the official lottery operator offers, including the jackpot, and you receive your prize money as if you had actually played the official lottery. As its name suggests you simply choose six numbers from a range of one to 49 or select the QuickPick option (Quick+1) to choose your numbers at automatically. After this simply click Submit. This will take you through to a checkout. Take a moment to review your order then, when you're ready, click Confirm and proceed to get your ticket for the German Lotto. On the night of the draw six regular numbers are drawn, followed by a Superball. To hit the jackpot you must guess all six regular numbers plus the Superball number correctly. Yes, you can win all the same main game prizes playing with us as you would in the official draw, including the jackpot. A single line costs just €1 while a line with the DoubleJackpot feature costs €2. Be sure to check to see which bonus games, if any, you wish to play as these, too, cost extra. The minimum base jackpot is €1 million. Jackpot sizes increase with regular rollovers though unlike many lotteries there is no jackpot cap. The current record jackpot is €45.4 million. The DoubleJackpot feature allows you to play for twice the official lottery jackpot. So, for instance, if the official German Lotto Lotto draw is €10 million and you play with us and activate the DoubleJackpot feature, you can potentially win €20 million. You will pay double the price of your normal line to activate the DoubleJackpot feature. So, if you wish to play the German Lotto Lotto with this feature you pay €4, instead of €2. When is the German Lotto draw? The 6 aus 49 German Lotto draw takes place each Wednesday at 6.25pm German time (5.25pm GMT) and Saturday at 7.25pm German time (6.25pm GMT). You can find the latest as well as previous Winning Numbers on our German Lotto Results page. The odds of winning the jackpot are 1 in 139,838,160. A breakdown of all the odds for each prize tier, together with estimated returns, is included with the next answer. How Important Is the Serial Number and How Is it Determined? The serial number is an integral part of the German Lotto. On the physical printed tickets that they sell in Germany you will find this number pre-printed. They influence both the main game and the three bonus games. At Lottoland we use the same number set and random number generation algorithm used on German Lotto tickets for our digital tickets. These are also independently audited to ensure they provide precisely the same number range and odds at all times. How Does the Bonus Ball Work? The Bonus Ball is drawn after the primary six numbers of the main lotto draw are drawn. The Bonus Ball is required to win the German Lotto jackpot and the number corresponds to the last number of your serial number. 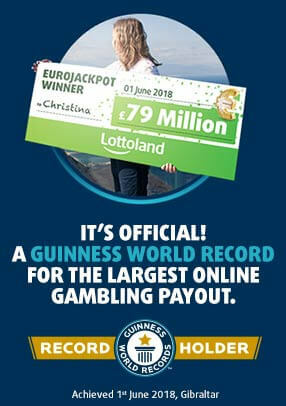 One advantageous option that Lottoland offers, that physical ticket players in Germany can't avail of, is the ability to select the last digit of your serial number. So, in other words, if you do want to change your Bonus Ball number you can. Spiel77 – or Game77 in English – is the first of three available raffle draws. The game corresponds to all seven digits of your serial number and the numbers must not only match, they also need to be in the same order as the drawn numbers to win. Super6 works in pretty much the same way as Spiel77, but only six numbers are drawn. These numbers correspond to the last six digits on your serial number. Once again you need to match the right numbers and they must be in the same sequence as those drawn. There are six fixed value prizes, starting with a guaranteed jackpot of €100,000. Finally, The GlücksSpirale (literally translated as "lucky spiral") is the last of the three German Lotto bonus games. The GlücksSpirale draw takes place on Saturdays only, so players should note that if they enable the GlücksSpirale option for a Wednesday draw they will, in fact, add this option for the upcoming Saturday draw. As with the other two bonus games the GlückSpirale is based upon your serial number and you must match both the numbers and the order of their drawing to win. Simply matching the last number on the GlücksSpirale will win you €10. All prize divisions have fixed values. Getting the last six numbers in the correct order will win you €100,000. Most exciting of all, however, if you're lucky enough to match all seven numbers you will win a monthly prize of €10,000 paid out each and every month for 20 years. The estimated returns are based on the results from Wed, 25th May, 2016. Subscriptions remove the hassle of manually entering tickets on each event and the fear of missing out on a big win. Our Subscription feature allows you to set up a running ticket (or tickets) on a given lottery draw. The subscription is open ended and will run for as long as you want it too. You can opt out at any time. Why should I play German Lotto at Lottoland? The German Lotto offers the second largest national lottery jackpots in all of Europe from just €1 a play. It also offers three different bonus games, including the GlücksSpirale, where you can win €10,000 every month for 20 years!